Hang the Birdola Black Gold Finch Seed Bar in your lawn and garden area to attract a variety of beautiful finches. This seed bar is made from a premium blend of seeds that finches love, and it also serves as an excellent source of protein and fat for a bird's high metabolism. The seed mixture comes molded around a plastic frame so that you can loop wire or string through the eye and hang the item in your birding sanctuary as a convenient alternative to loose seed feeding. 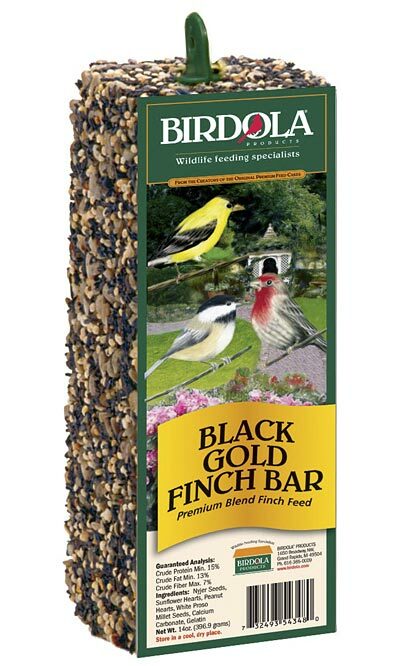 Offer the Black Gold Finch Seed Bar as a new food source in your yard and tiny birds will flock to it. Made in the USA.